Vapour Organic Beauty consists of high-performing natural products, made with 70 percent organic ingredients. The line is formulated without water or other fillers, which means they are super concentrated and enjoy a longer shelf life. Vapour only uses biodegradable ingredients and recyclable packaging in order to minimize their environmental footprint. Two exceptional products from Vapour Organic Beauty are: Stratus Soft Focus Instant Skin Perfector and Atmosphere Soft Focus Foundation. Vapour touts Stratus Soft Focus Instant Skin Perfector as the original organic BB Cream; a 3-in-1 moisturizer, primer and no-color foundation. Stratus Soft Focus Instant Skin Perfector is applied like a primer and leaves a smooth base for makeup application while achieving a natural soft satin finish. From the first application you will see a difference as it works instantly to blur imperfections, hydrate the skin and add radiance without a trace of residue. Vapour’s Light Reflective Technology immediately perfects the appearance of your skin – revealing a younger and fresh complexion. Effortlessly achieve the look of radiant, healthy skin with Atmosphere Soft Focus Foundation. This buildable, medium-to-full coverage foundation delivers a flawless and luminous finish. The lightweight formula evens the complexion and instantly perfects the skin. Vapour’s Light Reflective Technology is used to blur the appearance of fine lines, wrinkles and pores. Atmosphere Soft Focus Foundation feels extremly moisturizing and nourishing on the skin. Easy to apply, it blends beautifully into the skin and provides the perfect naturally healthy finish. Great for use in the colder months when skin looks dull and lackluster – this foundation will brings the skin back to life. Both Stratus Soft Focus Instant Skin Perfector and Atmosphere Soft Focus Foundation are made with 70% Certified Organic ingredients and 30% natural mineral pigments & vitamins. Nourishes with Organic Pumpkin and Papaya complex and brightens skin with Organic Camellia. Infused with Vapour’s face specific infusion of anti-inflammatory Frankincense, antioxidant Tulsi and moisturizing and calming Lotus flowers. All the performance of a luxury moisturizer and foundation with none of the chemicals. Vapour Organic Beauty raises the bar for revolutionary performance and purity with their Soft Focus line. Designed to balance all skin types, including combination and oily skin, the Soft Focus line will work for everyone. Both of these products can be worn separately, however, when used together they create the dynamic duo. There is often a misconception about the use of oil on the face. I believe that the term “oil-free” has brainwashed us to reject these magnificent moisturizers. Face oils can be more effective at hydrating the skin than a cream or gel-based moisturizer. Oil is able to sink to the surface of the skin and penetrate two of the five layers of the epidermal, producing quicker results. They nourish the skin, adding powerful vitamins and antioxidants, and help balance the skin’s natural oil production. Rodin Olio Lusso Luxury Face Oil: Formulated with an aromatic blend of 11 essential oils, this opulent oil relies on flowers and botanicals for their calming and illuminating properties. A staple of many top pros and makeup artists, this oil can be used to take makeup off, to moisturize and as a massage oil (expensive massage oil?). Add a couple drops to foundation to create a dewy finish or pat on the cheekbones and undereyes for a beautiful, fresh glow. Just a few drops will make your skin look radiant. Use as an alternate or supplement to your moisturizer and apply whenever your face needs a pick-me-up. Creator, Linda Rodin spent over a year mixing oils in her bathroom (in a coffee cup) to make the elixir to satisfy all her beauty needs. She does not promise miracles–she is neither a chemist nor a scientist. She is interested in simple, natural products that work. In her own words, “the product makes skin look more alive”. Decléor Aromessence Neroli Essential Serum: Full Blog Post Review HERE. SUTI Nourish Organic Face Oil for Night: A potent blend of 15 plant and flower extracts that strengthen the skin and promotes the regrowth of skin cells while you sleep. Formulated with Avocado, Sesame, Patchouli and Bergamot to heal, replenish and plump-up dehydrated skin; Macadamia and Geranium to balance the production of sebum (the skin’s natural oil production) for healthy moisture retention; Argan Oil to calm irritated, inflamed and blemished skin and Apricot Kernel to help promote dermal elasticity. This combination is intensively “nourish”-ing, luxurious, and smells of fragrant jasmine. Skin looks glowing, bright and plump in the morning, like you’ve just had a wonderful night’s sleep. SUTI is created by two sister-in-laws Suzannah and Tina (the “Su” and “Ti”). 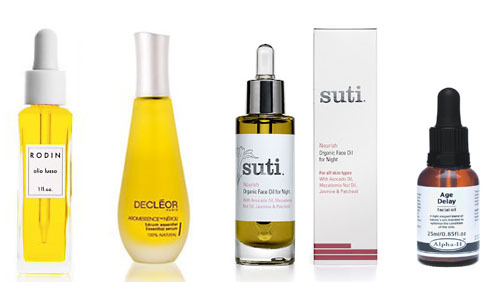 SUTI is a small, impeccably crafted line from the UK that uses only sustainably sourced, organically grown ingredients, hand-blended into the finest and gentlest of facial oils, balms and tonics. Alpha-H Age Delay Facial Oil: A preventative and corrective solution formulated with nine of nature’s finest oils: Apricot Oil for it’s protection and softening properties; Rose Hip Oil to repair and strengthen: Wheat Germ to nourish; Calendula to regenerate; Carrot Oil to improve skin texture and miximize moisture levels; Frankincense for it’s firming and toning benefits; German Chamomile to soothe; Lavender to heal; Patchouli to aid in repairing cells and balance the skin. This facial oil is a synergistic mix that works to slow the aging process by protecting the skin against free radical damage, repair cell damage and sun damage. Deeply hydrates and firms the skin for instant, noticeable results. Your skin will drink this oil up and immediately feel soothed and nourished. Australia’s leading professional salon treatment brand, Alpha-H pioneered the use of fruit acids in skin care nearly 20 years ago. Their cult cosmeceutical formulas are endorsed by a global following of clinicians, make-up artists and beauty writers and are relied upon by thousands of therapists worldwide for their fast and visible results on signs of ageing, sun damage, sensitivity and acne.